Citation lived at Oregon Zoo for 14 years. The grand old lady among America’s captive zebra population has been sadly farewelled at the great age of 37. In her youth, Citation was so fleet-footed she was named after one of America’s most famous racehorses. However, age finally caught up with her. She was euthanized at the Oregon Zoo Monday night. Citation, who was a Damara zebra, also known as Burchell’s or plains zebras, had been the oldest zebra in the entire US zoo population, a sociable and much-loved zebra. “We knew this day was coming, but that doesn’t make it easier,” said keeper Diane Gould, who worked with Citation ever since the zebra’s arrival in Portland 14 years ago. Gould said Citation got along with all the species that shared her Africa Savanna habitat over the years: lesser kudu, gerenuk, hooded vultures — even an “ill-tempered Egyptian goose”. And, of course, the wild mallards that show up at the zoo each year, a trail of ducklings in tow. Citation was born at the Kansas City Zoo on August 30, 1975, and moved to Portland in March 1999. Jan Armstrong, former animal curator at the Kansas City Zoo, is understood to have named the frisky zebra foal after the famous racehorse Citation, a Triple Crown winner in 1948. Despite her advanced age, keepers say the zebra had been doing well until recently. Last week, she began dropping food due to a tooth overgrowth. Like horses, zebras’ teeth continue to grow throughout their lives and can develop sharp points on the molars, requiring what is known as “floating,” or filing down. Local equine specialists were called in to examine her teeth, but it was clear Citation’s health was deteriorating. On Monday night, a late-shift keeper called zoo veterinarians to report Citation was down and apparently unable to stand up. Vets assisted the elderly zebra to her feet, but she only stood for short time with legs splayed, unable to remain upright on her own. Not wanting Citation to suffer, zoo staff made the difficult decision to euthanize her. “As painful as it was for us, it was the most humane option,” zoo deputy director Chris Pfefferkorn said. The zoo hopes to acquire more zebras in the future, according to Pfefferkorn. Until then, the habitat Citation once occupied will remain home to gerenuk and Speke’s gazelle. 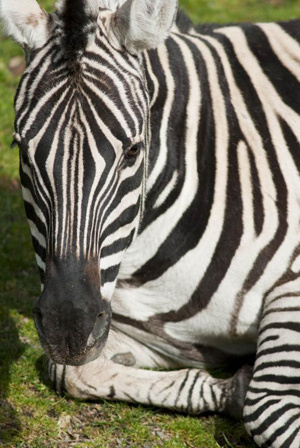 Part of the challenge in acquiring new zebras, Pfefferkorn said, is finding ones that, like Citation, are well suited to a mixed-species environment, since zebras are sometimes aggressive toward other animals. Damara zebras are the most common and widespread zebra in Africa. They live in the savannas of eastern and southern Africa. They can be distinguished from other subspecies of plains zebra by their stripes: Between the usual black stripes, Damaras have an additional gray “shadow line.” A zebra’s particular pattern of stripes is as unique and defining as fingerprints are to humans. Damara zebras typically live 20 years or more. They are very social animals, and have exceptional hearing and eyesight. When a threat is perceived, zebras will run, reaching speeds up to 40 mph. The plains zebra makes a sound quite unlike the neigh of a horse or the bray of a donkey; its alarm signal is a yelping bark. While not endangered, the Damara zebra population is thought to be in decline.